This is the message that Nutrition and health: The Vegetarian Way has for you. Few people realise that diet is not just about weight management but about health management too. Better nutrition helps you in more ways than you might realise. It helps you fight infection and ward off disease, lose weight and stay trim, cope better with stress, and remain healthy and active. With these recipes and dietary guidelines, and tips and facts for better health, you will be well on your way to a healthier and happier life. Jinadal Naturecure Institute (JNI) - a charitable hospital aims to promote drugless treatment/therapy without compromising on the principles of naturopathy, which reestablishes the faith that "All healing powers are within the body itself"
The Institute in its unique way is devoted to bring health awareness among the suffering humanity through Naturopathy, yoga and vegetarianism. Life cannot be sustained without food, which is, in fact, one of the basic needs of life, the other two being air and water. Man needs sufficient nourishment for growth, development and maintenance of health. What we eat matters greatly for the maintenance of normal health and prevention of diseases. Many diseases of the modern day, such as obesity, diabetes, coronary heart diseases, low backaches, high BP, asthma, arthritis and migraine are all the result of digestive disorders, and have their roots in the kind of food we eat, and the way it is prepared or processed. Advancement of science and technology in preserving, canning, processing and producing foods has certainly added varieties of convenient foods, but certain methods have proved to be fatal to the human body and the safety of a few others is still suspected. Chemical fertilizers sprayed with alarming casualness in farming, gases used for artificial ripening ripening of fruits, and preservatives used for canning, results in our consuming quite a lot of chemicals, prolonged intake of which is definitely harmful. There is, therefore, need to cultivate the habit of eating fresh foods, as far as possible. Proper nutrition and adoption of sensible eating habits can surely reduce the risk of illness. Fruits and vegetables in their natural from are the best diet of man, for which he is physiologically most fit. Man can develop great resistance to disease with this diet and a regular healthy lifestyle. Utmost care is to be taken while cooking. It should be borne in mind that for the sake of taste, we should not deviate from the basic purpose of food, which is nourishment. With the above in mind, the Institute of Naturopathy and Yogic Sciences has brought out this book to give you an idea as to what is to be eaten and when and how. Please do not forget Palm C. Bragg's dictum: "You are what you eat." A very natural sequel to the unique experience of all the patients at this Institute is the question - "Doctor, what should I eat, and what should I avoid eating when I get back home?" This book makes an attempt to answer such queries. It is designed to serve as a guide not only for the sick, but also for the convalescent and the healthy. 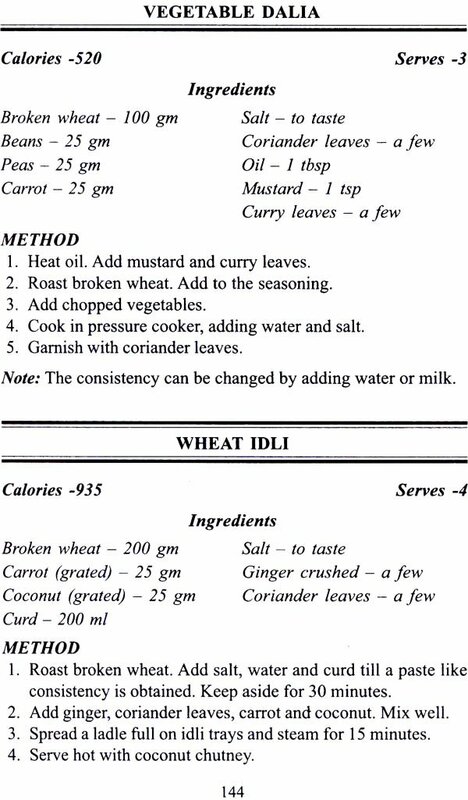 The last chapter deals with recipes ideal for patients. The dishes suggested are flavoury, tasty, nourishing and appealing with their natural colours. Patients who have undergone nature cure treatments and advised to continue a follow-up diet should avoid excessively spicy ingredients in the preparations. Most of the preparation will be tasty even with very less spices. 1. Fruits are naturally cooked by sun's rays when they ripen and hence easily digestible. They help cleanse the body too. 2. Sprouts, raw vegetable, salads and fruits are living foods, more beneficial than cooked foods. 3. 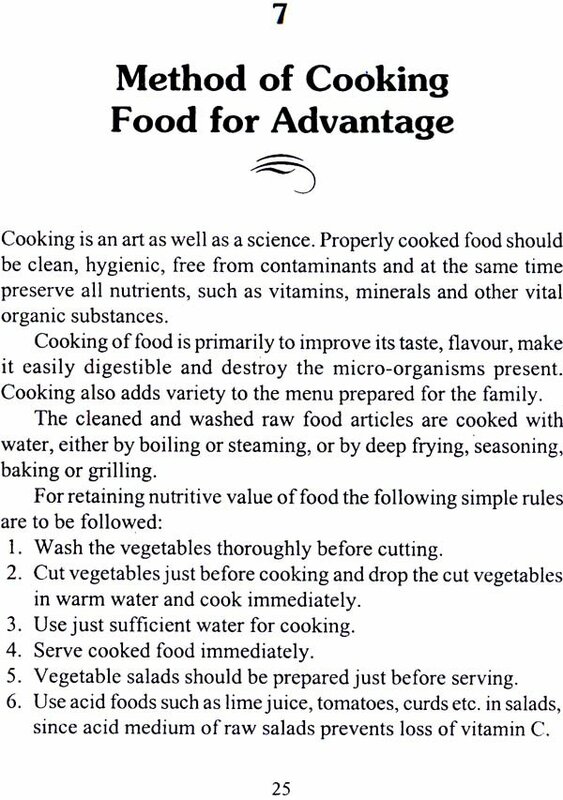 It is vital to adopt the correct cooking techniques to minimize the loss of nutrients, which occurs during traditional and unscientific cooking methods. 4. Eat only when you are hungry. 5. Overeating causes indigestion and lead to diseases. 6. Drink your solid food and eat your liquid food. Diet plays a unique role in curing diseases and maintaining health i.e., while sick or in healthy profile. It is the customary practice of every branch of science to involve the father of medicine, Hippocrates and his versions to support the theory and philosophy of that branch. The same is true with the naturopathy also. Hippocrates also preached "Thy food thy medicine" and "Thy medicine thy food". This great man was afflicted by migraine and followed diet restrictions for overcoming it. But in between dietetics lost their significance and could not find a place in medical science. The doctors did not take the diet into consideration for curing or preventing diseases, and instead solely depended on medicines. Ayurvedic system emphasises the importance of diet by saying that 'if you follow pathya, you need not take any medicine and if you do not follow the pathya, no medicine can help you' . However, modem doctors are advocating dieting for curing disease as well as maintaining health. The patients are also increasingly following the diet to eradicate disease. It is needless to say that dieting has become popular even with people, who are figure and beauty conscious.